This was my first piece of work down by handpainting with acrylics. 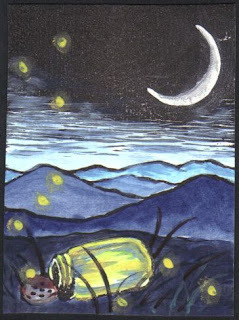 I also used pearl pigments for the first time to add shimmering effects to the jar and the fire flies. We loved seeing fireflies for the first time last spring down in Mississippi - they were so fun. We just sat and watched them for a good long time.